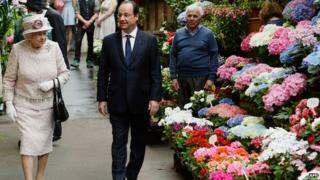 The people of Paris have paid tribute to the Queen by naming a flower market in her honour. She and the Duke of Edinburgh toured the market that will henceforth be known as Marche aux Fleurs - Reine Elizabeth II on Saturday. It marked the end of the British monarch's three-day visit to France to mark the 70th anniversary of D-Day. On Friday she joined other heads of state on Sword Beach to commemorate veterans and their fallen comrades. The Queen, who visited the market on her first trip to the country in 1948, unveiled a plaque to mark her visit. Afterward she boarded a private plane with the Duke of Edinburgh following a ceremonial departure from France, attended by French President Francois Hollande. Earlier in the day, the Queen visited Paris' City Hall where she was welcomed by mayor Anne Hidalgo and hundreds of well-wishers who lined the streets outside. Sir Bradley Wiggins, the first Briton to win the Tour de France, also attended the flower market close to Notre Dame Cathedral, in the centre of the city. He attended with a team of charity cyclists who are travelling from Brussels to London, via Paris, to raise money for Help for Heroes. On Friday night, the Queen was guest of honour at an Elysee Palace banquet hosted by President Hollande. She spoke of her pride in the courage of the Allied forces who took part in the D-Day landings, but added: "Our peace and prosperity can never be taken for granted and must constantly be tended, so that never again do we have cause to build monuments to our fallen youth." Alternating between English and French, she also told the banquet that Britain and France each have a role to play as "two of the trustees of international peace and security". In a speech described as warm and affectionate in tone, Mr Hollande said the Queen was a woman who personified the phrase: "Keep calm and carry on". Mr Hollande described the two nations as being "like twins" and concluded: "I lift my glass to the great British people, ally and friend of the French people."